I was not happy with the last effort I made on this nebula. Played with the data for a couple of hours this evening. Total is 21 hours of SHO - gathered in September. Last edit: 5 months 3 weeks ago by Kinch. I thank you once again for your lecture last Monday night for the Irish Astronomical Society (IAS). 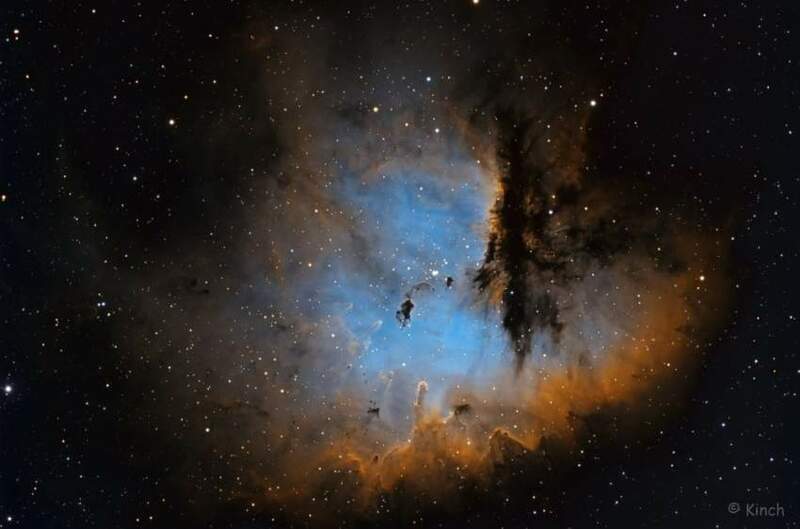 This image of Pacman NGC 281 is simply breathtakingly beautiful. Thank you for improving it and for sharing it with us here. By the way, have you thought about producing an image of M33 the galaxy in Triangulum? Not to worry if you decide against. It's just that John Flannery highlighted it on Monday night. Thanks Aubrey. It was great to meet up with you on Monday. I was so sorry that the times slipped by so fast and left little opportunity to talk more with you and others that I met up with for the first time. As for Triangulum and indeed other galaxies, I really hope to be able to get out more to dark sites over the coming months to do that type of imaging. Such objects will come through so much better away from the light pollution that surrounds where I live. My last effort at Triangulum was in Nov. 2015. (See: www.kinchastro.com/m33-triangulum-galaxy.html ). I am sure I could improve on that nowadays - if I get the opportunity.